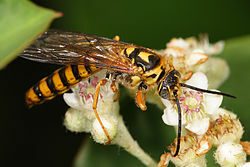 The Tiphiidae (also known as the tiphiid wasps or, rarely, flower wasps) are a family of large solitary wasps whose larvae are almost universally parasitoids of various beetle larvae, especially those in the superfamily Scarabaeoidea. Most species are small, but they can be up to 30 mm long. The females of some subfamilies (all Brachycistidinae, Diamminae, Methochinae, and Thynninae) are wingless, and hunt ground-dwelling (fossorial) beetle larvae, or (in one species) mole crickets. The prey is paralysed with the female’s sting and an egg is lain on it so the wasp larva has a ready supply of food. In species where both sexes are winged, males are similar in size to the females, but are much more slender. The males of species with wingless females, however, are often much larger than the females and have wings, the adults mating in the air, with the female carried by the male’s genitalia. Adults feed on nectar and are minor pollinators. As some of the ground-dwelling scarab species attacked by tiphiids are pests, some of these wasps are considered beneficial as biological control agents.